Last year Alden Pellett and I began toying with the idea of checking out new spots to climb ice in western Newfoundland. Over three trips we'd climbed 8 of the classic routes in Ten Mile Pond, one of North America's finest ice climbing cliffs, and were interested in what other options existed. We found a few things in the process, but realized that access to most other areas is not simple the way it is at Ten Mile Pond. This year, Chris Beauchamp, Bayard Russell and I ran with this idea. Exploration was a top priority for us. The result? Well, a trip with very little climbing but one that was an incredibly rich cultural experience. I'm sure Bayard will write about his experience, and Chris will share some photos when he has the chance too. Here's my story. 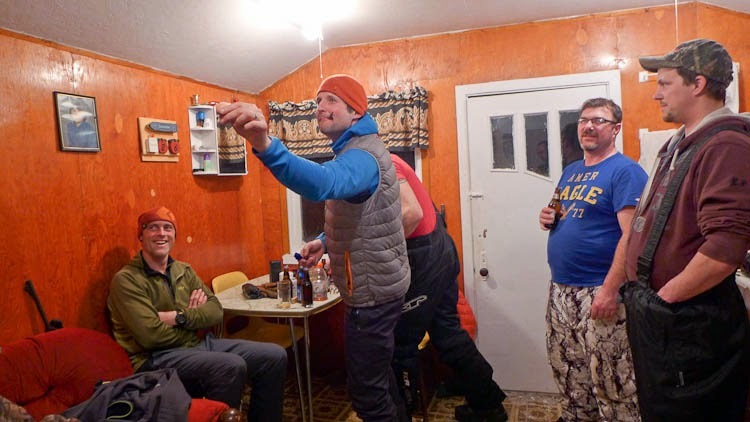 About a month prior to this year's trip, my regular Newfoundland ice climbing partner, Alden Pellett, called to let me know he couldn't make it this year - something had come up. He is such a great partner to have when the going is tough - he makes good decisions and isn't afraid to lead when the climbing is scary. I was upset, but not as upset about it as he was I think. Chris Beauchamp had already agreed to go this year. He was in the second he saw last year's photos. We wanted a third person though, so Chris could take pictures when the opportunity presented itself. I scrambled to find a solid third on such short notice, contacting many of the northeastern folks I thought might be interested in the trip. After only a few emails, Bayard Russell agreed to go. Wow. That was easy. I've known Bayard for seven or eight years now, but only climbed with him a handful of times. Our first outing together was the Steck-Salathe on Sentinel Rock in Yosemite. We were back in camp drinking beer by mid-afternoon. Like me, Bayard is driven by an intrinsic interest in east coast climbing, and the allure of adventure climbing in the northeastern U.S. and Canada. Somebody switched on the autopilot. Everyone prepared on their own. Chris found some used snow tires and had them mounted so we could take his vehicle. Bayard did a lot of food shopping ahead of time, to keep us well supplied on our trip. I struggled, trying to carve out time for packing and some climbing between my three science classes, homework, and guiding. Chris, Bayard and I left Bayard's house at 5:30 a.m. It's fun traveling with 3 people. The driving is easier and the conversation is always more diverse. At 9:30 a.m. we stopped for gas in Bangor. Bayard walked out of the Irving gas station with two hot dogs and a bottle of Gatorade. Only 20 more hours of roadside junk food and we could go ice climbing in Newfoundland. At noon, in Calais, ME we stopped at the supermarket for more cheap U.S. beer. Outside we bought giant spicy foot long sausages from a crass-talking guy in a barfwagon named "Grampie Bill's". I have a penchant for junk food. It seems I'd found two good road trip partners because they were making me feel like a health nut. Our drive across New Brunswick and Nova Scotia was easy. I've driven across these two provinces 8 times now. Good weather for the entire drive is rare. The ferry was on schedule too. Things felt way too easy. After a huge fried food feast at a Chinese restaurant (nothing like a strong finish to a stellar day of healthy eating) near the ferry terminal we retired to our berth and slept our way across the Cabot Strait. 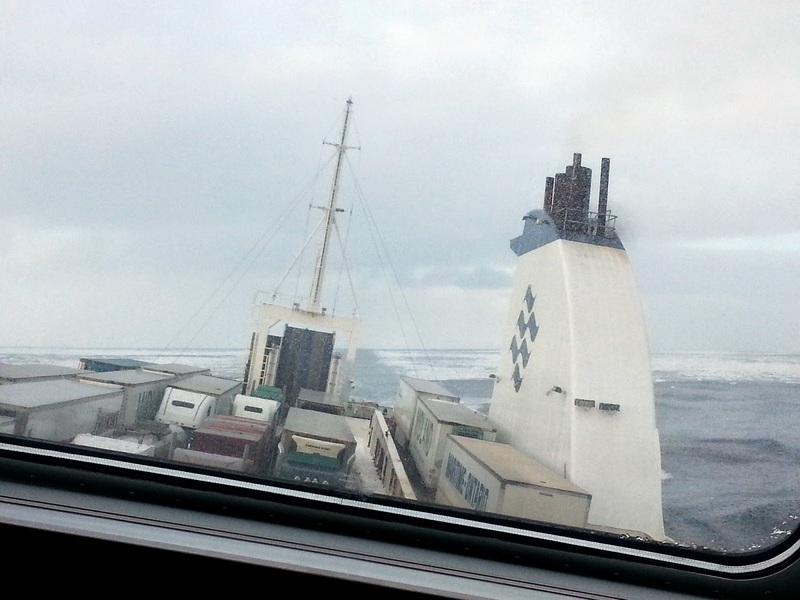 The MV Blue Puttees, our ferry, crept silently through sea ice. The ocean was frozen - giant tiles of artic sea ice had floated down past Labrador and Newfoundland. For ice climbers in Newfoundland, this is always a good sign. Sea ice stabilizes the weather, making things cold and calm. The big ponds, like Western Brook, only freeze when the sea ice stretches all the way down the coast, across the Strait of Belle Isle and into the Gulf of St. Lawrence. All the way up the west coast we were greeted by a completely white, frozen ocean. For someone who's never experienced this, it's utterly bizarre. The ocean doesn't freeze in New England, and yet it was completely frozen here. I'm sure it was thick enough to walk on too, but you couldn't pay me enough to do that. Day 3 began in a bar. At 11:00 a.m. What a strange way to start our day. Half an hour later, we'd made some new friends and had a plan. Our new friends, Terry and Bevin would show us the way in to the end of the pond. 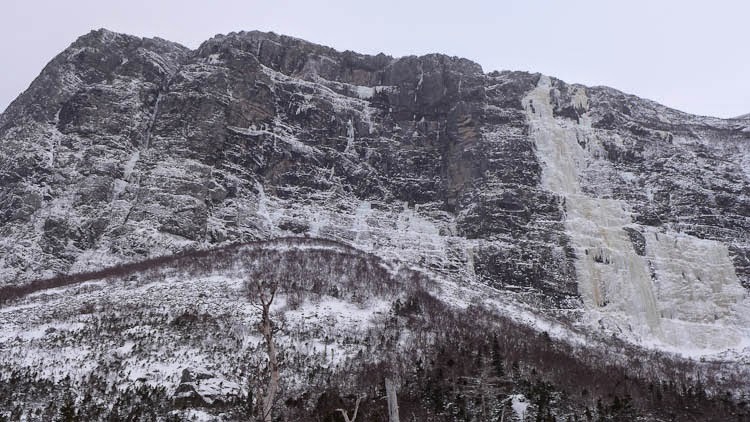 There, we'd camp and try to climb a few big routes in a seldom-visited area of Gros Morne National Park. The completely amazing events that ensued are straight out of a Newfoundland hospitality advertisement. Bevin and Terry loaned us two snowmobiles, and a sled to haul our gear. They let us stay with them and their friends at Bevin's uncle's cabin. 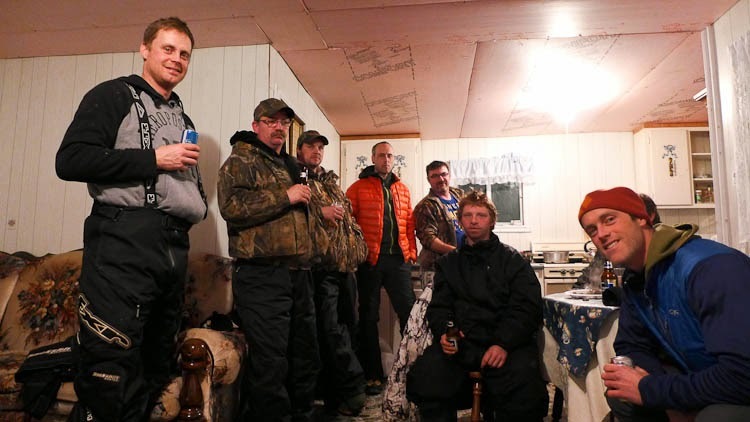 They fed us moose meat, moose sausage, stew and shared stories about life in Newfoundland. They rung our clocks at darts. No joke, Newfies are seriously good at darts, especially at 2 a.m. after many beers. In the morning they showed us the trail we needed to follow. The snowmobiles were ours to use until we were ready to leave. This unbridled display of hospitality is part of what makes Newfoundland such a special place. Nobody in Massachusetts would loan out their snowmobile to some dude who's never even driven one before, especially if they didn't know that person. They definitely wouldn't open theirs doors to you and leave you a duffel bag full of moose meat to eat while they're away. And they wouldn't invite you in for beers after your trip is over either. The next time you meet a person from Newfoundland, offer them a place to stay, a hot meal and good company. It's the right thing to do, and it's likely they will gladly repay you in kind when you visit their home. We managed to climb a big new route, a 300-meter WI 5 at the back of a big basin. 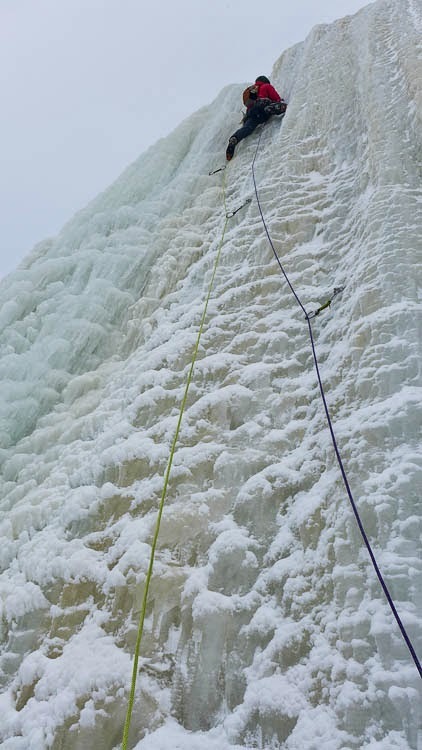 We saw many other spectacular looking unclimbed lines too. It was mind blowing really - very remote, insanely rugged, really cold, and constantly windy. Looking back though, the climb seems like such a small, almost insignificant part of our experience. After a rest day we climbed in Ten Mile Pond too. The access there is easy. As it turns out, it was a dry year in Newfoundland and many of the climbs were lean. The Cholesterol Wall had very little ice on it. Even during a lean year, the climbing in Ten Mile Pond is like candy - it's easy to access and so good. With two back-to-back nor'easters coming up the coast we decided to leave early. We caught the only ferry off the island for four days. Back on the mainland, we booked across Nova Scotia hoping to avoid most of the bad weather. In New Brunswick the maelstrom arrived. 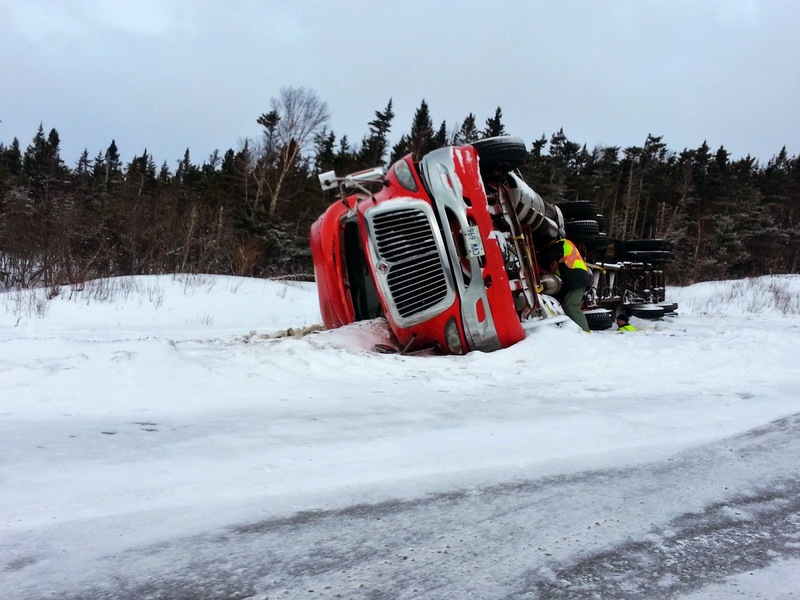 Unplowed roads with 3-foot deep drifts along the roadside made exiting the highway difficult. Whiteout wind gusts with extreme blowing snow made it impossible to see. It was the worst weather I've ever driven through. We made the decision to stop and sleep a moment too late. The blowing snow was so thick we couldn't see the hood of the car. Before we knew it we were floating through a cushion of soft snow on the side of the highway. It was 3:30 a.m. on a Sunday morning. There was no traffic on the road. 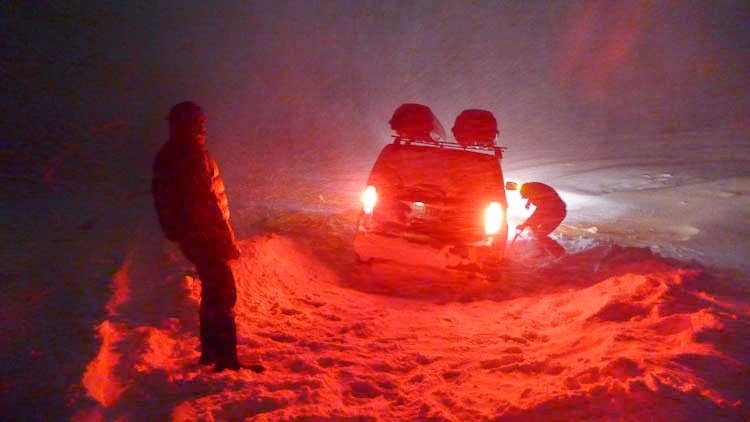 After a long session of digging and pushing in gnarly wind and blowing wet snow two passersby helped us push Chris's vehicle back on the road. At 6 a.m. we finally crashed in a shady motel on the outskirts of St. John. By noon Sunday we were back on the road, fueling the long ride across Maine with donuts from Tim Hortons, more hot dogs from the same Irving in Brewer Maine, and burgers from Wendy's. Things have a way of coming full circle. This trip, my fourth, to Newfoundland involved the smallest amount of climbing thus far. At the same time it was perhaps the most rewarding. Getting to know local Newfies, who love where they come from and strongly identify with the landscape around them, was very inspiring. 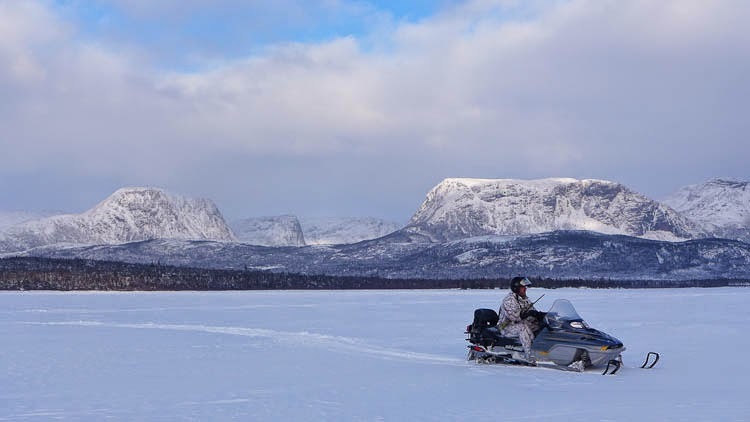 It makes me want to return, not just for the ice climbing, but for the people, fishing, hunting, and hiking that abounds in that region of the province. 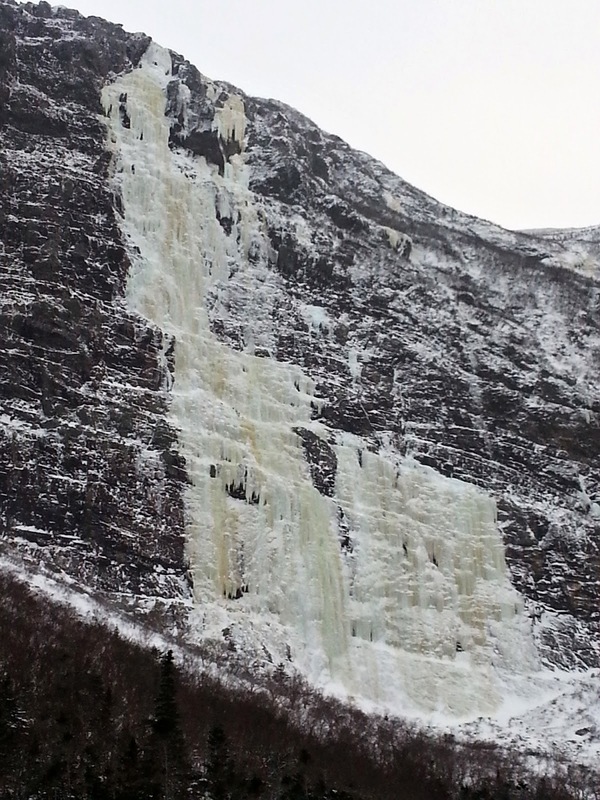 Ice climbing in Newfoundland is a lesson in patience. So much of the time is spent getting there and coming home. The weather never cooperates for the whole drive. 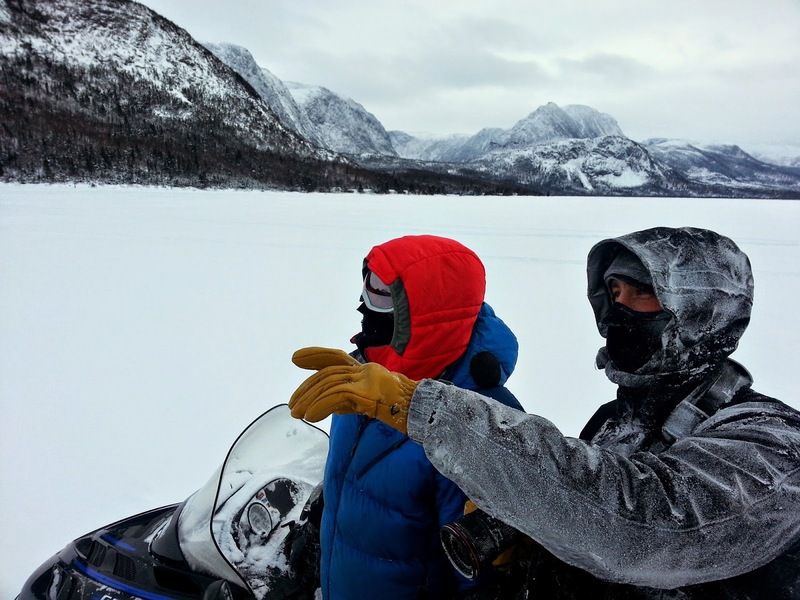 While you're there, the approaches are long, and the logistics can be challenging, especially if you don't own a snowmobile. 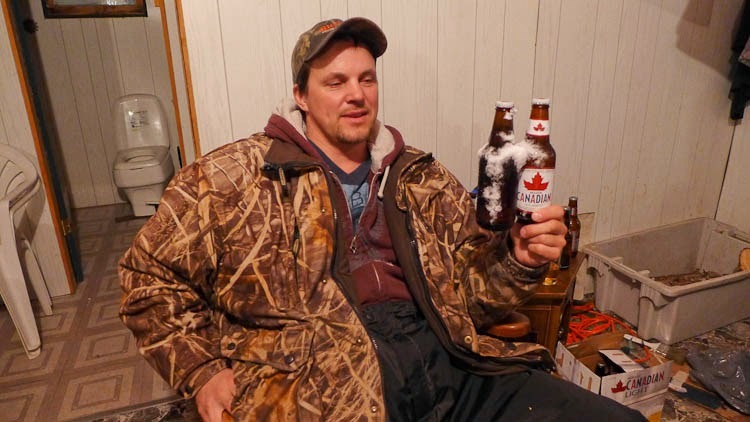 Even if you do own a snowmobile, traveling across frozen tidal lakes, giant deep ponds and near unfrozen high volume creeks is sketchy, and it's nice to have a local's knowledge of the place when approaching these spots. Despite these challenges it's still my favorite place to climb ice, and a place full of many future winter adventures.